A precise and velvety cream for the thin skin in the area around the eyes and the neck. The unique formulation efficiently restores hydration, radiance and glow that have been lost from the fine skin with the passage of time. 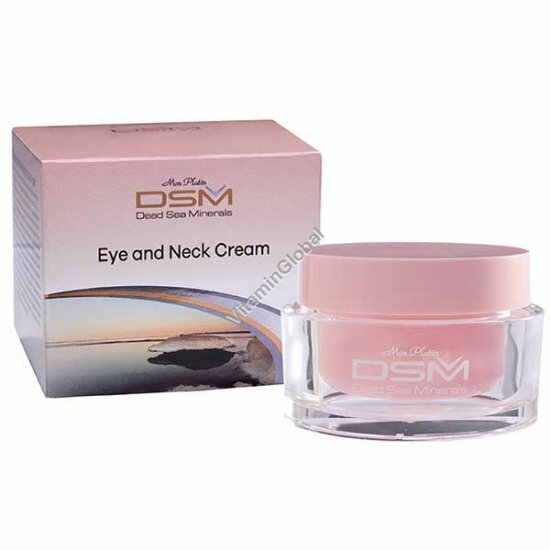 The eye & neck cream contains a complex of vitamins and minerals from the depths of the Dead Sea which help reduce swelling and hide dark circles in the fine area around the eyes. The cream isn’t oily, permitting the application of make up immediately after its use. Directions: Apply Eye & Neck Cream and gently massage into the area around eyes and neck until completely absorbed. Do not use on blemished skin. Ingredients: Water (Aqua), Glyceryl Stearate, Cetyl Alcohol, Isopropyl Myristate, Stearic Acid, Palmitic Acid, Glycerin, Phenoxyethanol, Capryl/Capric Triglyceride, Shea Butter, Fragrance (Parfum), Sodium Benzoate, EDTA, DMDM Hydantion, Lactic Acid, Imidazolidinyl Urea, Tocopheryl Acetate (Vitamin E), Dead Sea Minerals. Allantoit, Retinyl Palmitate (Vitamin A), Sorbitol, Urea, Butylphenyl Methylpropional, Linalool, Sodium Lactate, Phosphoric Acid, Benzyl Salicylate, PEG-40 Hydrogenated Castor Oil, Ethylhexylglycerin, Hydroxycitronellal, Citronellol, Alpha-Isomethyl Ionone, Hydroxyisohexyl 3-Cyclohexene Carboxaldehyde, 2-Bromo-2-Nitropropane-1, 3-Diol, Geraniol, Panicum Miliaceum (Millet) Seed Extract, Avena Sativa Karnel (Oat) Extract. PARABEN FREE, MINERAL OIL FREE, SILICONE FREE.